Ready for a speedtest shootout? Normally, when we ask you to post up screenshots from your phone, it’s to show off your beautifully crafted home screen setups. Today, we’re going with something a little different that has more to do with your carrier and location than anything. We want to see speedtests from around the country on your carrier of choice. Since almost all of us have either a 4G LTE or HSPA+ device, we should be able to put together quite the list. 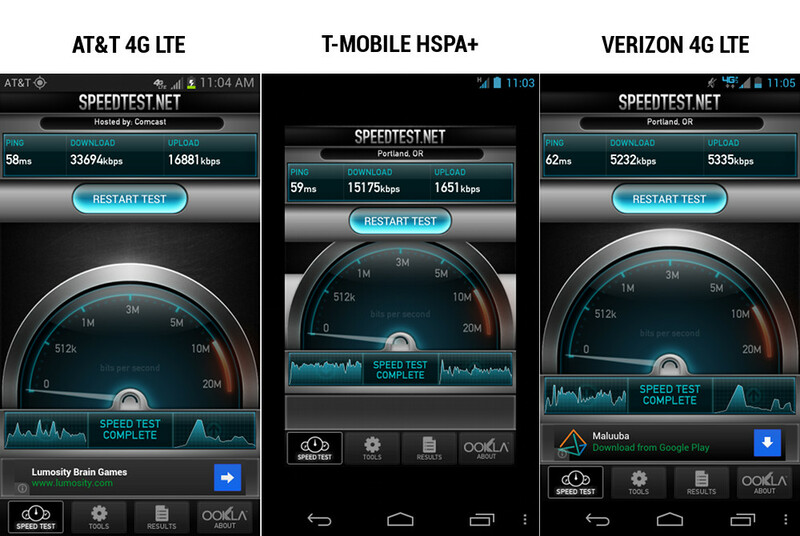 As you can see from the screenshots I posted, I was able to compare AT&T and Verizon’s LTE with T-Mobile’s HSPA+42 from my house. AT&T was the clear winner for me here in Portland, followed by T-Mobile, with Verizon struggling to keep up. That could have more to do with my location than anything, or maybe Big Red’s network just has too many damn connections on it these days. What about you? Feel to run a speedtest with the Speedtest.net app and then post the screenshot in the comments. Be sure to list your carrier and city/state.